1. Children with autism were taught perspective-taking skills. 2. Following training, skills transformed to new tasks. 3. Relational frames were established in the participants. 4. Implications for treating children with autism are provided. All procedures performed in this study which involved human participants were in accordance with the ethical standards of the institution and/or national research committee and with the 1964 Helsinki declaration and its later amendments or comparable ethical standards. Informed consent was obtained for participation in this research. The last author receives small royalties from sales of the PEAK curriculum. Barnes-Holmes, Y., McHugh, L., & Barnes-Holmes, D. (2004). Perspective-taking and theory of mind: A relational frame account. The Behavior Analyst Today, 5, 15–25. https://doi.org/10.1037/h0100133. Dixon, M. R., Speelman, R. C., Rowsey, K. E., & Belisle, J. (2016). Derived rule-following and transformation of stimulus functions in a children’s game: An application of PEAK-E with children with developmental disabilities. 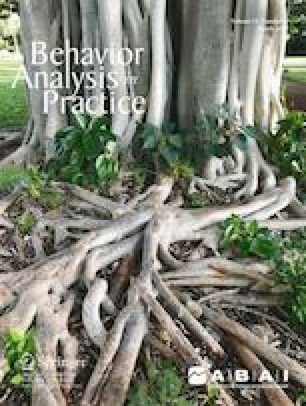 Journal of Contextual Behavioral Sciences. https://doi.org/10.1016/j.jcbs.2016.05.002.